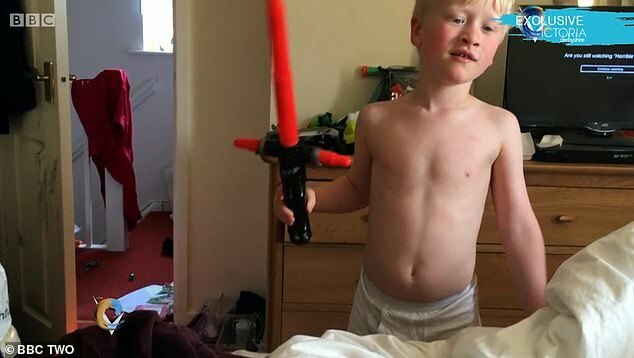 A mother has shared heartbreaking footage of her son's violent outbursts in a bid to raise awareness about a lack of support for families affected by autism. Suffolk mum Kate, who did not share her surname, told the BBC's Victoria Derbyshire show she was struggling to get support for seven-year-old Jamie who is prone to kicking, punching and spitting at her during his frequent 'meltdowns'. Jamie has pathological demand avoidance (PDA), a rare form of autism that can lead to excessive mood swings, anxiety and, in his case, violent behaviour. The BBC Two programme spoke to several families with autistic children, revealing how many parents are struggling to cope with the behavioural demands and feel that they have 'zero support'. It followed a report from Royal College of GPs which found that doctors in some rural areas have to apply for extra funding to diagnose autism patients. There are fears that families are in danger because they are not getting support quickly enough, reporter Noel Phillips explained. In one scene, Jamie is seen hitting his mother repeatedly with a toy sword and spitting her, as she tearfully begs him to stop. She later revealed the video had been captured one morning, with the youngster becoming angry and distressed because he didn't want to go to school. Another clip showed the aftermath of one of Jamie's meltdowns, with clothes and objects strewn all over the house. Kate can be heard saying: '[Jamie] went upstairs to the toilet and I managed to get him out of the toilet because he'd locked himself in there. As she watched the footage back, Kate said: 'Part of me can't believe that that's my child in some ways, because we have some really good times but when I see that [...] it's quite traumatic really.